General Instrumentation section Parker Tube Fittings. 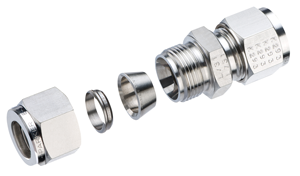 This includes twin ferrule compression fittings, which is the A-LOK range and also the CPI range of single ferrule compression fittings. Abdex can help supply information on interchangeability between other brands. A-LOK is accepted in clean applications such as medical or pharmaceutical. The rear ferrule on A-LOK fittings is hardened with its patented Suparcase method while the nut can be offered with a silver plated coating which helps with anti-galling. CPI is easier to install / troubleshoot and works better in applications where multiple tightening and untightening is required. CPI has the moly thread lubricant. Which enhances the life. Suparcase ferrule is slightly harder than nitride and has better corrosion resistance. All burst pressures are based on ANSI31.3 which is approximately 4:1. In all cases working pressures are limited to the capability of the tube. Abdex Australia are the official premier Parker distributor. To find out more about this, see our Parker A-Lok flyer.